Worn by our hero pilots during the great wars and the legends showing off their stuff at air shows. Why is the flight suit such a popular piece of flying attire but is hardly worn by civilian pilots even though they have so many positive attributes outside of also looking ridiculously cool? Open cockpit aircraft created the need for garments that could keep pilots warm and dry during missions in bad weather. The idea of making it all a one-piece came from the need to prevent clothing being destroyed, damaged or removed during bail-out situations. Originally made from leather and sheep wool, times and aircraft have changed and today light weight, thinner and more comfortable materials are being used to make the modern flight suit. Covered with lots of pockets, zips and Velcro patches, a flight suit has an allocated storage space for everything from pens to maps to peanuts for those early morning hunger pains before a breakfast fly-in. It also has a zip that opens from the top and the bottom, allowing the use of a relief tube while strapped into the seat of a fighter jet or just for the convenience of not taking the entire suit off to go to the bathroom. Dirt, blood and oil is also an inevitable part of aviation and flight suits help keep your own clothes clean, dry and stain free - things that will keep your wife very, very happy. According to Kerry Parker from Airwear, a flight suit is a functional and protective garment. She believes that as long as the world relies on hydrocarbon fuels, protection against the dangers of fire is required. 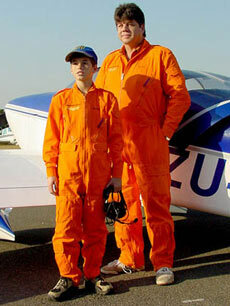 Airwear flight suits are made from KERMEL or PROTAL, fire resistant fabrics woven locally. Usually available in navy, orange or my favourite, air force olive green, Airwear specialises in the production of high quality tailor-made flight suits and can customise them to literally suit your specific needs. Transparent map pockets or leg writing pads can be added as optional extras. Wearing a fire proof flight suit would significantly improve your chances of survival should you ever be an accident and be faced with an unexpected fire. 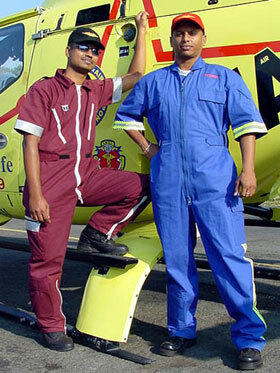 Airwear also offers 100% cotton flight suits that are light and very durable and are sold at a lower cost compared to the KERMEL or PROTAL fire resistant ones. These cotton suits are also available in more colours like natural cotton, medium grey, charcoal, black, khaki, orange, red, burgundy, royal blue, navy, olive and bottle green. All Airwear flight suits are made individually and are not from a mass producing factory, allowing customizations to meet your specific needs. 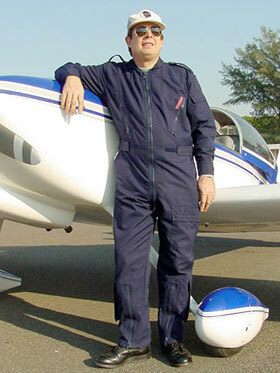 By wearing a flight suit you can improve your safety whilst enjoying flying and working around the field, but it will also dramatically improve your cool factor. Air forces around the world would not bother issuing their pilots with flight suits if they didn't deem it a vital necessity. For any enquiries or for more information you can contact Kerry Parker directly via email at airwear@mweb.co.za or visit www.airwear.co.za to take a better look at the products and services they offer on their website.